This picture shows just one example of how things can go wrong in the workshop… Not shown: the previous melted, unattached or broken off pins – all surmountable. This… not so much. The fossils weren’t as fused as well as I thought, or as well as other examples I have – oh well! 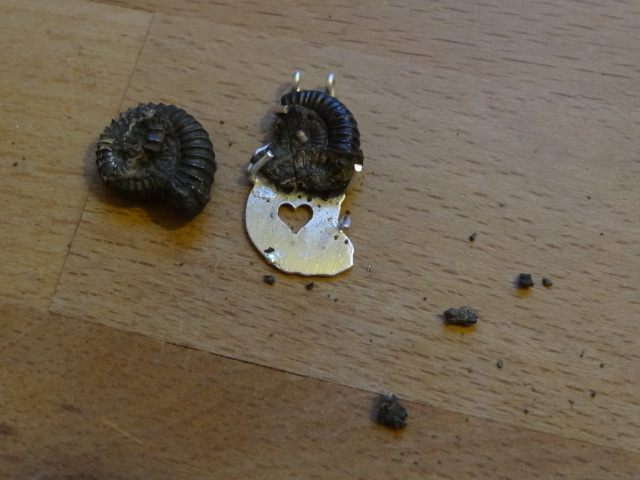 Otherwise just an hour, some silver, solder and gas gone, and I’ll be back on the horse after the weekend. Previous PostPrevious Slaving over a hot easel, and What I Learned.